A spectacular two bedroom two bath, plus Queen sleeper sofa, located in the "Copper One" building, top floor, penthouse level. 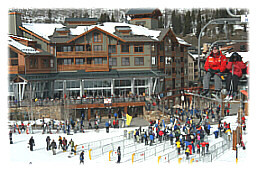 Awesome views of the mountains and surrounding valley, right in the middle of the American Eagle and American Flyer lifts, in the heart of the "Stone of Fire Plaza." Any closer to the lift and you would have to help load. Enjoy a gas log fireplace, full kitchen, DVD/CD/VCR, surround sound, digital TV, full cable, TV and VCR in every room. Complimentary English tea, Kona coffee, and hot chocolate provided Includes personal ski locker, laundry facilities, secured heated underground parking, exercise/sauna and spa facilities, complete ski services, clothing shops, coffee shop, restaurant/bar and entertainment, all in the building. Leave the Copper One building and in a few steps you are in a 5 star restaurant, shopping on Main Street, bike rentals, biking, pony rides, horse drawn sleigh/hay rides, rock climbing, swimming, tennis and U.S. Forest Service Guided hikes. Complimentary chairlift rides daily from mid June through Labor Day or head up the lift with your mountain bike and enjoy endless bike trails. Use the 24,000sq. 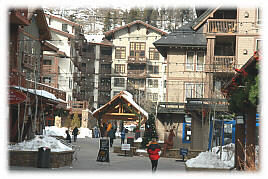 Ft. Copper Mountain Racquet and Athletic Club and indoor pool or play golf at the 9650 ft. Copper Creek Golf Club. It’s the highest championship golf course in North America. If you want to be in the middle of everything, it doesn’t get any better. Enjoy the entertainment, the people in the village, music and a laser light show at night, all from your private balcony. If you stay 5 nights or more during the winter ski season, we will provide coupons for four, "buy one get one free" adult ski lift tickets and two children’s, buy one get one free coupons. Some black out dates apply, a $155 value, ask for the details. We have a limited number of coupons. See "Other Information" below for more details. Location! Location! Location! It doesn’t get any better than this. We want to offer your family and friends the best. 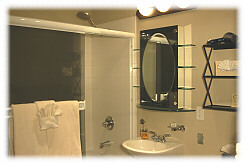 Please compare other Condo’s location and prices. 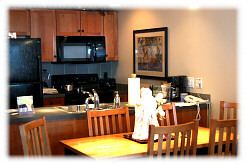 We offer one of the best locations for less if you like being where the action is. Mountains and Small town location. Copper One Building 5th floor, penthouse level, at the slop in the "Stone of Fire Plaza", 1 1/2 hours from Denver Colorado. Secured and heated underground parking. Other activities/entertainment: Horse drawn sleigh/hay rides, pony rides, US Forest Service guided hikes, laser light show, rock climbing, 24,000 sq.ft Copper Mountain Racquet and Athletic Club and complimentary chairlift rides from June through Labor Day. Coupon valid daily, Opening through Dec. 25, 2002; Jan 6 through Mar. 7, 2003; and Mar. 31 through closing; or Monday-Friday, Mar. 8, 2003 through Mar. 30, 2003. *Coupons not available with rental rate discounts. You will be able to buy up to four discounted lift tickets per day. 10% food discount at Copper owned food courts and restaurants. 15% discounts on adult group ski and snowboard lessons. 10% discounts on kids group ski and snowboard lessons.